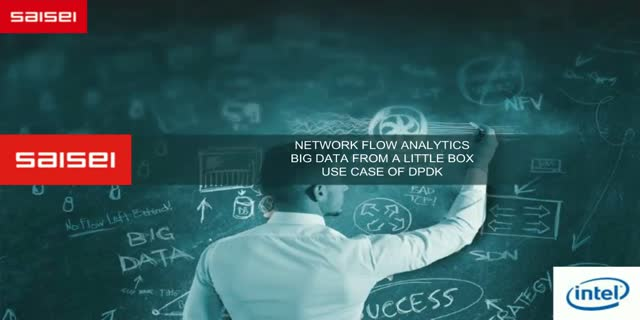 IP Flow data is at the heart of most network visibility and analytics solutions. Acquiring a complete view of the network based on flow data records is a technical possibility, but almost never actually implemented in practice because of the complexity and compute, storage, and network overhead that make the implementation impractical and almost requiring a data scientist to deploy. In this webinar, Saisei will discuss how its Big Data network analytics software, coupled with open source DPDK and Intel processors, enable a distributed IP Flow analytics model that makes billions of network analytics available in less than a second through distributed network sensors. The Saisei Flow Data API designed on top of DPDK is making the previous impractical task of gaining 100% network visibility a reality -- delivering complete visibility and network analytics data on-demand to users directly or through any of their current management tools. And it's doing it with a 1000th of the network, compute and storage overhead previously required. Saisei is making Big Data networking possible without the big box, overhead, complexity and costs.